It has been an extremely long time between posts. Mainly because I have been busy so hopefully I can do some retrospective catching up. 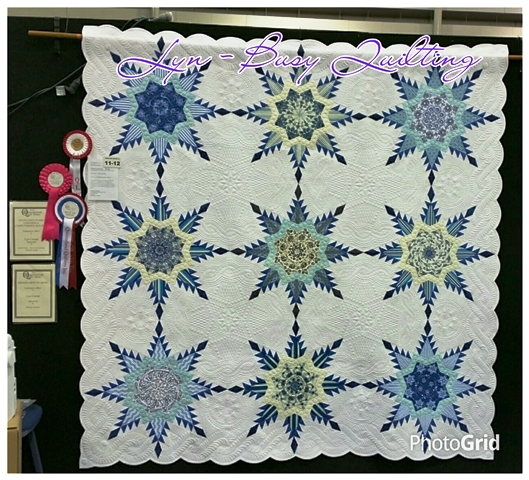 The latest and possibly best news I have had is the Best of Show win by my quilt Featheration 2Blu at the recent Queensland Quilters Inc 2015 Show. This quilt will now be considered with the other 7 state winners for the Best of Australia in April next year before it sets off on a journey around Australia and New Zealand to the respective State Quilt Shows. To say I was extremely excited would be an understatement. My new Bernina B720 machine is already ensconced in my sewing table and it hasn't been home for even a week. It just means my trusty Janome 7700QCP is now looking for a new home.